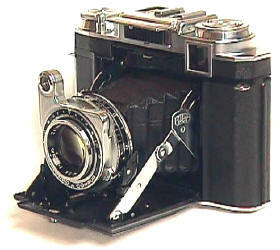 Zeiss Super Ikonta B's are 6x6cm (2 1/4 x 2 1/4) format. Made from the early 1930's to the middle 50's, the various versions can be confusing. 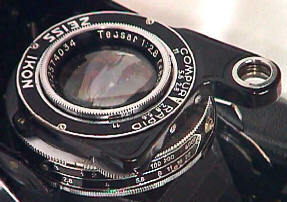 Using the 80/2.8 Tessar, the best Tessar was the post war coated version. 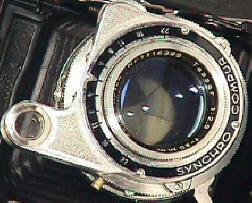 The best shutter is the post war Synchro Compur. 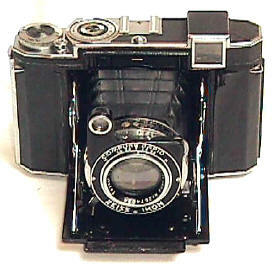 Simplified versions without rangefinders were "Ikontas" (as opposed to "Super Ikontas") fitted with less expensive lenses and shutters. 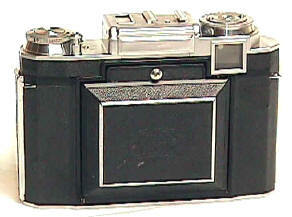 Early versions are labeled "Super Ikomat." 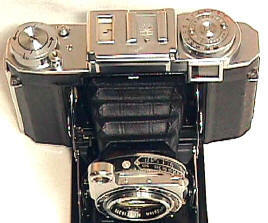 Luckily the Super Ikontas A, B, and C all used easily available 120 film in your favorite modern emulsion. 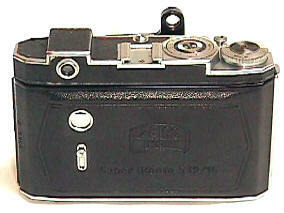 The D had an even larger format, for long discontinued 616 film. Not shown, separate rangefinder/viewfinder windows, all black trim. Otherwise similar to next version. 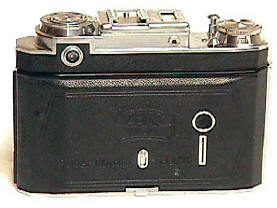 Combined rangefinder and viewfinder windows. . Pre-war and early post war examples had uncoated lenses. Chrome trim started a few years after the war. 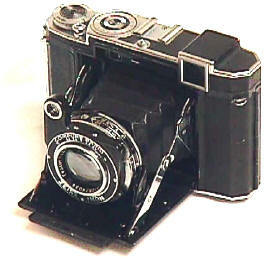 Shown is a post war chrome version, with uncoated lens. Last version with Synchro Compur shutter and MX flash sync the most valuable. Embossed on back door leather is (532/16). 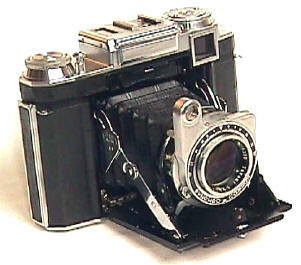 Features include a combined viewfinder/rangefinder, double exposure prevention, top mounted shutter release, and mechanical film counter. No built in meter. Uncoated 80/2.8 or 80/3.5 Tessar. Compur Rapid's top shutter speed 1/400th. Not Shown. Basically a (532/16) with an ugly uncoupled selenium meter stuck on top. 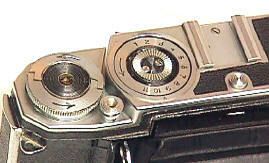 Combined rangefinder and viewfinder windows. . Pre-war and early post war examples had uncoated lenses. Chrome trim started a few years after the war. Last version with Synchro Compur shutter and MX flash sync the most valuable. Embossed in back door leather is (532/16). Compur Rapid shutter, NO flash sync. The last and best version of the Super Ikonta B. Coated 80/2.8 Zeiss Tessar or Zeiss Opton Tessar lens -- no difference in quality. Slightly smaller body than previous version. Has Synchro Compur shutter with MX sync with shutter speeds from 1 second to 1/500th plus B. Meter uncoupled. Obviously try to find one in the best condition your budget will allow. The quickest way to identify the later cameras is to look for the MX flash sync. This will also pay off when you eventually decide to trade or sell. Watch out for fogged finders and lenses. 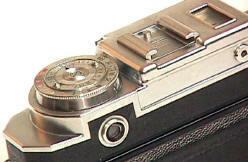 Make sure the bellows is without holes -- a replacement bellows is expensive. The body leather usually did not age well. Test the shutter at all speeds. If you want to make a shooter out of it, expect to invest in an overhaul if it has been sitting around for decades waiting for you to show up and fall in love.